I have to admit that my players took me completely by surprise during this session. When we had last played, they had agreed to scout out in detail the army currently massing around the Black Tower. In preparation, I had mentally mapped out several possible courses of action so that I was at least nominally prepared for it. As seems to happen every time I invest this kind of prep time, however, my players came up with something completely different. They had long been very uncomfortable with the necromancers of Redwraith. They understood that they did leave people alone and that they did check any potential power that spewed forth from the Black Tower, but the idea of fighting necromancy with necromancy was repugnant to many of them. Even Dn. Swibish, who had was from Redwraith and wore a thanati worm given him by the necromancers was tired of running from them, their false accusations and their assassins. As such, they saw the impending battle as a perfect opportunity to assassinate the necromancers of Redwraith. By their estimation, the army at the Black Tower was no match for the full force of the Redwraith army. So, they set about baiting Redwraith into attacking the army at the Black Tower and then ambushing as many necromancers as possible in the confusion of the battle. The first step was to go to the dwarves of the Brass Citadel south of Redwraith to hire some sappers. The players took full advantage of the mistrust that the dwarves had for the necromancers to get them to help in pulling off their scheme. Through a cocktail of various spells, the players snuck the sappers in place to take out the various obelisks that created the mass Protection from Undead field around the Black Tower. They then went to Redwraith to report that the field was down. Of the seven necromancers that sat on the council of Redwraith, four marshaled the city’s army, while three stayed behind to bolster the city’s defenses. The players decided to ambush these three. It was at this point that the players got really lucky. The necromancers had a magical system to monitor the city from their tower. Thus, they had a decent chance to see the ambush coming (even given their focus on making sure the defenses were sound); however, the roll I made indicated that they were taken completely by surprise. When they had planned the ambush, the players did an excellent job of putting all their magical options on the table and that first surprise round was devastating. Despite getting off a Dispel Magic and a couple of summoning spells to try and cover an escape, only one managed to get away. By then, the players realized that the battle around the Black Tower hadn’t gone as planned. The machine at the center of the Black Tower camp had been destroyed. It had been keeping a tear in space and time somewhat in check. With the machine destroyed, the tear became a portal and a third army came pouring through. It was a group of several hundred toad men led by a slaad and anchored by a titanic frog-like creature writhing with multiple tentacles covered in spikes. This turn of events took everyone by surprise and both the forces of Redwraith and the army around the Black Tower were crushed. The players soon realized that this horror was making its way to do the same to the city of Redwraith. Thus, they quickly covered their tracks, and then introduced themselves to the leaders of the remaining Redwraith forces as the agents that had taken down the obelisks. Needing as many swords on the walls as they could muster, the general was willing to ignore some of the holes in their story and the session ended with a massive battle as the toad men assaulted the city from several fronts. Protecting the archers on the wall that were tasked with taking out the titanic frog-like monster. Dealing with the slaad and a group of toad men cavalry mounted on giant frogs. Dealing with a group of toad men spell casters. They chose the first and did a magnificent job. Things got a little dicey during the first couple of waves because their initial set-up was not as effective as they expected it to be, but they made some in-battle adjustments to their line and they managed to keep their archers virtually unscathed. As a result, the big frog thing died under a hail of arrows. In the mean-time, a group of dwarves from the Brass Citadel aided in the battle by assaulting the spell casters, protecting that flank. In the end the only flank that did not do well was the one with the salad and his toad men cavalry. Due to the successes of the other flanks, however, the salad was forced to retreat. The is now a portal that allows slaadi access to their immediate neighborhood. There is a rogue salad along with some toad men cavalry at large. One of the Redwraith necromancers is still alive and will likely seek revenge. The political situation in Redwraith is in chaos. The council of necromancers is gone. The bishop died in the chaos of the battle. The dwarves of the Brass Citadel are making demands based on the key role that they played in the battle that saved the city. All the primary leaders within the military of Redwraith were killed at the Black Tower. As a result, there is a huge power vacuum. At present, I am rather badly afflicted by Gamer ADD. I’ve spent time meditating on a couple different campaign ideas in my last couple of posts; my Lost Colonies campaign just had a rather climactic event (of which I will write later) and my players are looking for a little break from the fantasy genre over the summer; and my eldest daughter has been bugging me about letting her and her brother play. The latter occurred after she found an old FRPG accessory I bought back in the late eighties. After Gygax was booted from TSR, he had an imprint called Gary Gygax Presents: Fantasy Master. To my knowledge it only produced a few accessories, of which I own Aesheba: Greek Africa by Robert J. Blake, Frank Mentzer and Jeff O’Hare. Though I think it a very good product, in the long run it is something that will never be anything other than an accessory to steal ideas from, because I am not much interested in playing in a fantasy world primarily influenced by Greek paganism. I would, however, be interested in playing in a world influenced by a fantasy version of the Byzantine Empire. Since virtually all of my extent campaigns (especially Averoigne and Lost Colonies) have a heavy dose of horror that I feel is inappropriate for my kids at their age, Aesheba is a great jumping off point for a campaign for my kids. Aesheba posits a version of Africa that is isolated from Europe and Mesopotamia, giving the authors plenty of room to fiddle with history and add fantasy elements. This suits me just fine, not only because of the leeway, it also affords me the opportunity to add two things that I feel obligated to include in such a campaign for my kids: dinosaurs and pyramids. When asked what they want to be when they grow up, my two oldest will answer paleontologist and egyptologist. In order to accommodate these interests in the campaign, I am going to grab the assistance of Paul Jaquays and re-skin his very excellent classic The Caverns of Thracia. For those that are not aware, The Caverns of Thracia is a module published by Judges Guild in 1979 and has one of the best conceived maps for a published module of all time. It has multiple ways into and out of various levels. There are secret sub-levels. There are teleportation devices. There is an underground forest and mansion. It is stunning and inspirational. It is, however, something that I would only run as written with a much older and experienced group. An ancient pre-human reptilian race that eventually devolves into lizard men. A Mycenaen/Cretan human civilization that (in part) is dedicated to Thanatos, the god of death. Beast men who had been enslaved by the humans and had risen up to destroy and drive out their former masters. The ancient reptilians will be one of the many serpent-like people available in various monster catalogues throughout the hobby. Three things of import: 1) theirs is a world where dinosaurs still exist and which some have been domesticated; 2) when humans show up, the serpent people enslave them; 3) either as a means to control the humans or as part of their native culture, they serve Set. At some point the humans rise up in rebellion against their reptilian masters. This rebellion is fueled by a new religion — Atenism. Personally, the pharaoh in whom I am most interested in is Amenhotep IV, aka Akhenaten. He led a failed religious revolution that did not survive him. This religion had trappings of monotheism focused on Aten — originally an aspect of the sun god Ra. One of the things I find fascinating is how it parallels early Judaism. Indeed, there are scholars who find a great deal of similarity between the Great Hymn to the Aten and Psalm 104. After the rebellion, the serpent people retreated, but not without some of their human slaves. In order to make them more pliable and to ensure that they would not again rebel, the serpent people started to do magical experiments on their remaining human slaves in order to create various beast men (kobolds as dog men, gnolls as hyena men, lizard men, etc.). These will be primarily based upon the various anthropomorphic Egyptian gods. Once enough of these had been bred, they sent an army of beast men to crush the Atenist rebellion. The beast men are now in control of the dungeon. Firstly, the Byzantines did not think well of wizards and sorcery. Thus, magic-users as written would not exist; however, there was a sci-fi/fantasy book I read a couple decades ago that postulated a version of the Greek/Roman Mediterranean where all the laws of ancient science worked instead of the laws of modern science. It had a very cool pseudo-magic/science feel. Thus, the magic-user will be replaced by the philosopher — a class that studies the sciences to create machines and devices with the same effects as magic-user spells. Elves will be substituted with Kemites — humans in the serpent peoples’ sphere of influence. They are akin to OD&D elves — able to adventure as either a fighter or a philosopher. Dwarves will be substituted with white apes — an intelligent ape race. Halflings will be substituted with pygmies — short humans that are really good with missile weapons. 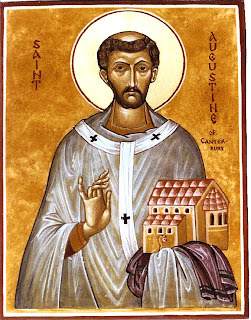 Today is the Feast of St. Augustine of Canterbury. An Italian Benedictine monk, he was sent to Britain at the request of Bertha, the wife of King Ethelbert of Kent. Though pagan, the king had married into the Merovingian line of Frankish kings, which by this time had become Christian. She wanted to restore a church built during the Roman era of Britain at Canterbury and dedicate it to St. Martin of Tours. The request was granted by the bishop of Rome, St. Gregory the Dialogist (who we Orthodox credit with the Liturgy of the Presanctified Gifts and who also, inspired by the chant he encountered in Constantinople, was the creator of Gregorian Chant). 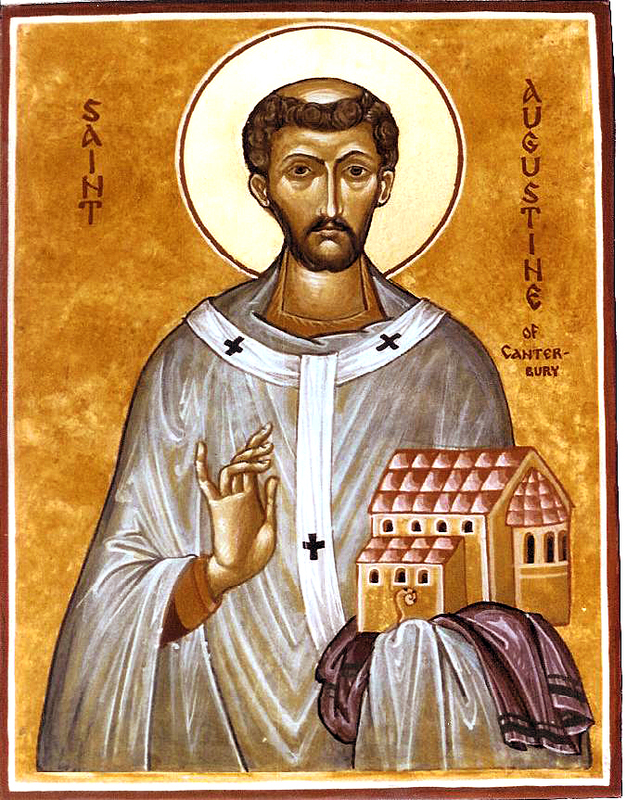 St. Augustine arrived at Kent in 597. Despite his pagan beliefs, Ethelbert was very cooperative with St. Augustine. The church was restored and the Christian Gospel was preached throughout the kingdom. Eventually, through his relationship with Augustine, Ethelbert became a Christian himself (and is today recognized as a right-believing saint celebrated on Feb. 25). According to St. Bede, Augustine was consecrated as Archbishop of Canterbury, built Christ Church (the predecessor of the present cathedral at Canterbury) and the monastery of Sts. Peter and Paul (now known as St. Augustine’s Abbey which eventually fell prey to the dissolution of King Henry VIII). St. Augustine was not entirely successful in his mission to Britain, however. Celtic Christians from Ireland had also been sending missionaries into Britain from the north (most notably from their outpost at Lindisfarne). St. Augustine came into conflict with these Celtic Christians over local customs (primarily over the date of Easter and monastic tonsure). While Augustine championed the customs of Rome, the Celtic Christians did not want to abandon their own. When he met with some of their bishops to seek unity in 603, the Celtic bishops had been instructed by a hermit to act based upon how Augustine greeted them. If he remained seated, he was to be rejected as arrogant and an unfit leader. St. Augustine remained seated. He would die two years later and it wasn’t until the Synod of Whitby in 664 that this conflict was settled in favor of the Roman customs. You will excuse me if I find this whole story incredibly inspiring: Pagan kings, Christian missionaries, native Christians vs. imperial Christians and ancient ruins being explored and restored. What more could I want for the basis of a D&D campaign? I could even import some of the stuff I’ve done for my version of Averoigne. The Village of Hommlet is caught in-between the Roman and Celtic Christians as they argue over which set of customs to follow. 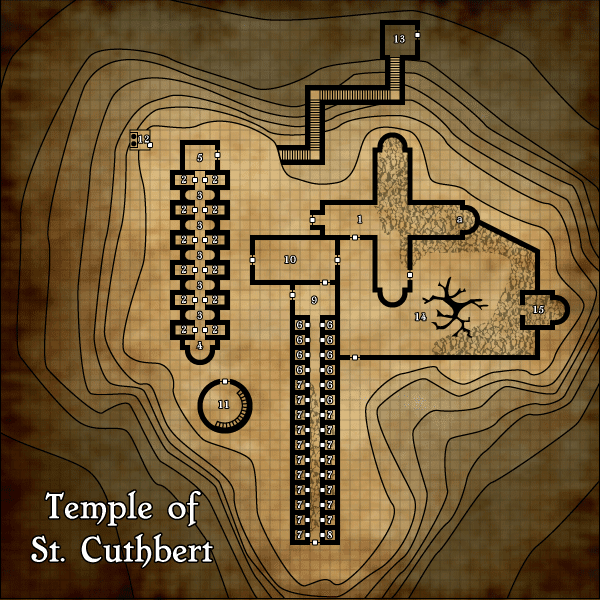 The Church of St. Cuthbert is currently under control of the Roman faction. All the “old-believers” in town follow the Celtic customs. Jaroo Ashstaff (the Druid) is a monastic hermit that serves as the spiritual leader for all the local Celtic Christians. Rufus and Burne represent Frankish/Merovingian influence in the area. While these two Christian factions argue with each other, the menace of an ancient pagan cult is finding the time and space in which to flourish. The local cult is lead by Lareth the Beautiful out of the Moathouse. Is there a possibility that one or more of the local nobles are funding this pagan cult as a means to discredit the newly Christian king? Can the players discover the pagan plot, unite the Christians and save the king before it is too late? Over the weekend, Library Bob, a fellow Orthodox Christian and gamer dropped me a comment on an older post of mine ostensibly about Traveller. He writes his own blog that occasionally touches upon his own Traveller game and was interested in tying his Orthodox musings to his Traveller musings. I found the idea intriguing enough that a bit of Gamer ADD has had me thinking about how I would run a Traveller game and the themes I might bring to the table. Let me begin by noting that a really good starting point for this discussion is the tragically cancelled Firefly (created by Joss Whedon, the genius behind the success of the Avengers) and one of the greatest sci-fi TV shows of all time. 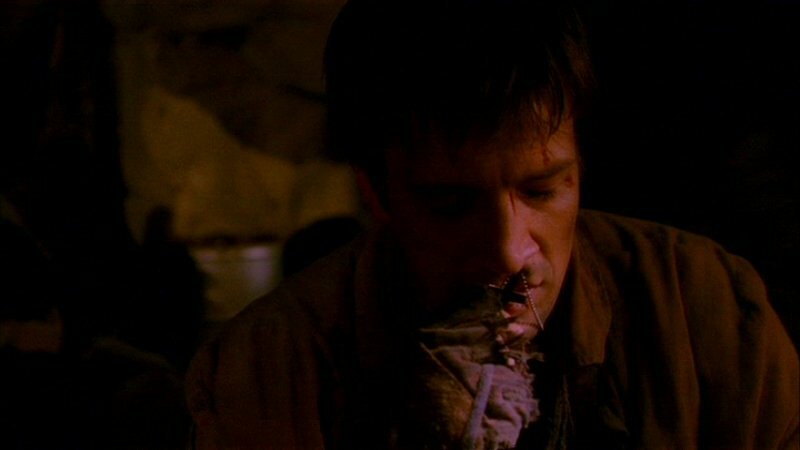 The reason being, Firefly plays with Christian themes and has Christian characters — including the main character Mal (despite his protestations to the contrary). In other words, sci-fi, Christianity and Christian themes are not only complementary, but can create some really great stuff. So, here is a short list of themes and ideas that I would use as the basis of a Traveller campaign. I have spoken on this blog a lot about the dynamic between the Chaotic/Demonic Wilderness vs. Lawful/Christian Civilization in D&D. This theme can easily be modified to fit into a sci-fi setting. In the history of the Orthodox Church, the Wilderness is normally associated with the desert — a stand-in for the Land of Nod where demons reside. It is the place where monasticism flourishes — where Christians of all ages have taken the offensive in the spiritual war against the devil and his minions. In a world where entire planets are civilized and even terraformed, the new desert will be outer space. The Wilderness will be unexplored planets in the outer darkness. I have long wanted to include a monastery inside a giant asteroid in an asteroid belt in a sci-fi campaign, for example. The key for this to work, however, is having some kind of demon. In D&D the are a plethora of monsters. Curiously, Traveller has always been human-centric even when it comes to its aliens (more on that in a bit) so this requires a bit of imagination. Firefly, though, has a great bit of inspiration — the Reavers. If one is willing to deviate from canon and if used properly, the Zhodani could also play this role quite well. One of the reasons I love the Third Imperium as a sci-fi setting is that it confronts the reality that the greatest alien is us. The idea that when humans finally make first contact, they come face to face with themselves is genius. It forces us, as players, to confront the question what makes a human human? Is it culture? Is it genetics? Is it the ability to create a Jump Drive? The fun part of asking this question (from a gaming perspective) is that if one limits that answer to any sort of category (and there are plenty of those available to one playing in the Third Imperium), it opens the flood gates of conflict. Historically, any time we take one aspect of the totality of what it means to be human and elevate it above ever other aspect, it always ends badly. Nationalism, fascism, communism, slavery and racism are all examples of this. Playing aspects against each other is a great way to generate adventures and even entire campaigns. Having the Solomani Confederation as a central part of a campaign is a great way to play with this theme. I have always been fascinated by the cultural conflict within Solomani space between its fierce independence, its racial pride and its totalitarian impulses through the ubiquity of the Solomani Party. Adding non-human aliens to the mix just makes the question more complicated. What is their place in God’s plan of salvation? How does Christ’s humanity speak to these alien species? Does his taking on human nature exclude them — again what is humanity? This is closely related to the question What is Humanity? due to the nature of Christ, who is both God and Man. In a setting that has an ancient alien race that toys with genetics and seeds worlds throughout the galaxy with humans and elevated animal species, one is tempted to doubt that there is a God who created all things. This doubt is a fantastic source for campaign ideas. There will be NPCs, planets and entire regions of space that will deny the existence of God. This denial leads people to try to replace God with themselves. As it has throughout human history, this course of action results in disaster of one kind or another. For example, take a look at the death toll of Communism and Fascism in the 20th century. Firefly plays with this theme with its conflict between the inner and outer worlds. When, as is revealed by the movie Serenity, the inner worlds try to play God, bad things happen. The Solomani Party has much in common with the Communists and Fascists. Therefore, they are a great way to play with this theme. If one has the Zhodani using psionics has an excuse to replace God with themselves, this can add a level of depth to both the psionic suppression and the Frontier Wars. One of the best ways to run a Traveller campaign is via Patrons — the folks who hire the players to do their dirty work. This, frankly, is one of the best ways to introduce Christian elements into the game. Patrons can be Christians (like those monks who live inside an asteroid). Or they can be those who work against Christians (like a politician who wants to prevent an important Christian relic from reaching a region/planet that the politician is having a hard time controlling/wants to take control of and sees the relic as key to his/her goal). Grrr. Now I want to play Traveller. Today is the feast of St. Patrick the Hieromartyr. He was Bishop of Prusa, which is a city in the region once known as Bithynia, now in the northwestern coast of modern day Turkey. In the area are some natural hot springs. The local Consul Julius attempted to persuade St. Patrick to his pagan way of thinking by pointing out that the bishop owed thanks to the gods for providing the springs for the benefit of humanity. The hieromartyr gave an answer that is surprisingly compatible with our own scientific understanding of the phenomena. He explained that there was a fire underneath the earth that heated the water which then welled up and produced the hot springs. Since God created the earth, fire and water he owed thanks to Jesus Christ through whom all things were made, not some pagan god of the spring. Angered by this answer, Julius had St. Patrick thrown into the boiling water of the spring. As with the youths in Babylon thrown into the furnace by order of Nebakanezer, it was those who threw St. Patrick into the water that were harmed, not the saint. Refusing to see this as a sign of the truth of the bishop’s words, the Consul had St. Patrick beheaded. This most likely happened during the reign of Diocletion (A.D.284-305). I recently noted via Zenopus Archives that domains have, at least in part, remained a part of the next iteration of D&D. For me this is disappointing, because it means that, at some level, Julius’ world view will be hard wired into the mechanics of the game and I will have to do extra work or forego several options in order to make St. Patrick’s view compatible with the mechanics of the game. Let me explain what I mean by using an understanding of Genesis that (while completely compatible with an Orthodox Christian understanding) does not fall under the popular literal interpretation of the creation story. Note that there are two different accounts of creation. Modern scholars place the authorship of Genesis 2 during the Babylonian exile and Genesis 1 during the period immediately after this period. Regardless of whether or not one places much validity in this time frame it does offer an interesting context with which to understand the creation accounts. When compared to the various pagan beliefs that would have surrounded the authors of the Genesis accounts, it is very easy to see them as polemics against these very beliefs. Indeed, Genesis 1-11 seems to be imbued with imagery from Mesopotamian myths, but with the narrative purpose of crediting Elohim for creating all of these various “domains” thought by the pagans to be divine beings. In other words, there is no god of the hot springs because God created the earth, fire and water. As an ironic aside, this understanding of creation — that plants, animals, rocks, water, etc. are mundane things created by God rather than as divine beings or things imbued with divine beings — is the only religious view of the ancient world that is not only compatible with modern science, but is the fertile soil in which modern science was able to flourish. If water is merely a mundane thing, it is possible to observe it and experiment with it rather than worship it. The mechanical use of domains by D&D 2e+ hardwired the pagan view of creation into the game of D&D. It necessitates a view that there is no one God that created all things (and therefore all domains). Rather, there is a plethora of gods, each living in or having power over a limited scope of creation. In other words, there is no room for St. Patrick and his world view. In other bit of irony, it also limited the scope of the pastiche that is D&D and therefore limited what I feel is the reason for its long-term success. One of the reasons I stopped playing D&D for many years was this domain mechanic. While I have created schemes to make domains compatible with my faith (using various cults of the saints instead of gods), it amounts to a level of preparation that is not only completely unnecessary in older editions of the game, but which, despite my best efforts, never quite overcame the pagan outlook of creation hardwired into the game. Thank God for the OSR. This is intended as an encounter area that can be placed inside a dungeon. This will appear as a boiling hot pool of water that radiates of magic. Anyone touching or entering the water will take 1d6 points of damage for every round of contact unless that person is currently being affected by a divine magic spell. For the duration of the divine magic spell, the person so affected will be able to take advantage of the magic of the pool. Anyone thus entering will be affected by a Sanctuary spell. In addition, depending upon the need of the person entering the pool, one curative spell will take effect. Cure Wound spells, Cure Disease, Neutralize Poison, and even Restoration are all available. Which ever spell is most needed (or, alternatively, the highest level spell that could affect the person entering the pool) is the one spell that will take affect. These curative affects of the pool can be used once per week. My afternoon today found me spending time comforting my oldest daughter who had a rather nasty spill on the playground this morning. One of her requests was watching an old episode of Secrets of the Dead with me. She, like me, is really interested in how scientists can reconstruct events of the past through the study of bones, ruins, artifacts, etc. The episode in question was an investigation of the disappearance of the Minoans. According to the show, we don’t know a lot about the Minoans. We just recently deciphered their written language (Linear A) and most of what we know is from myth. The Minoans had a cult based upon the bull and there is evidence that they made human sacrifices which were then eaten. This, of course, is strongly associated with the Greek story of the minotaur — the bull headed man who ate his victims alive. The Minoans also likely had a female priesthood associated with some kind of snake goddess — among the various Minoan artifacts is a statue of a woman holding snakes in her hands. I couldn’t help but wonder if this weren’t the origin of Medusa or some other serpentine monster. This also made me call to mind another episode which detailed how the Aztecs not only ripped the heart out of their human sacrificial victims, but took bones from their victims as trophies to hang in their homes and even ate them. All of this reminded me that while we who are fond of fantasy and play FRPGs tend to associate such behavior with the mythological and the monstrous — the scene from Two Towers where the orcs are arguing over whether or not to eat Merry and Pippin comes immediately to mind — all of this nasty behavior can be traced back to human beings. Not surprisingly, in both the case of the Minoans and the Aztecs this sacrificial cannibalism is justified via a twisted combination of religion and politics. Continuous sacrifice is made necessary to both appease the gods and keep various populations under control. This is a pattern, by the way, that Christianity shatters. Rather than demanding sacrifice, Christ gives Himself up as the ultimate sacrifice once and for all. It is also a pattern that keeps popping up once Christianity is pushed to the side — the Jews under Nazi Germany and the Bourgeois under Communism, for example. Although one of the primary uses of RPGs in general is escapism, I cannot help but believe that RPGs (particularly FRPGs like D&D) can be very good at holding up that mirror to the fallenness and brokenness of humanity. Personally, I am forced to ask the question every time I play — are the monsters sin personified (and therefore unsalvageable) or are they human in some way fashion or form (and therefore worth saving)? This is particularly true when I have a group of players that enjoys talking to monsters as much as fighting them. I have said it before, and I will say it again: one of the reasons that D&D is as successful and enduring as it is has to do with the fact that it is a pastiche. This allows a tremendous amount of freedom for we as players to explore (or not) just about anything we want to bring to the table. It can be both pure escapism and the horror of looking at the monster that is fallen humanity. I recently had a conference in Lake Geneva, Wisconsin and though I did not get much of a chance to wander around and get a sense of the place, I was acutely aware that I was in the place where my favorite hobby was essentially born. It reminded me that within a four hour drive south one could also find the birth place of both GDW, creators of Traveller, in Normal, IL and Judges Guild in Decatur, IL. Recently, James over at Grognardia asked the question if there was such a thing as “California games.” He cites Runequest, Arduin and Warlock and now (thanks to Dan of Gobinoid Games) Wizards’ World is also part of that tapestry. In Orthodox Christianity, there is still a very strong pull towards the pilgrimage. I myself have done so on several occasions — to Mt. Athos, Thessaloniki (to follow the footsteps of St. Paul), and the island of Aegina and the tomb of St. Nektarios. There is a personal presence that accompanies these places because of the people I went to see — the various saints of the Orthodox Church. There is also a very powerful sense of the holy. Lake Geneva, Normal and Decatur are not Mt. Athos, Thessaloniki and Aegina, but I cannot help but wonder what it is about the plains of the Midwest that inspired such a creative explosion in the 70s. It is a reverse of James’ question about California: Are there common themes in gaming cultures that coalesce into a certain kind of game? I would ask: How much does a sense of place have to do with these expressions? Given that the primary place for gaming culture is no longer something one can find on a map, is this question even relevant any more, or am I just waxing poetic because of a deep sense of nostalgia? As G+, FLAILSNAILS, Kickstarter and POD become the new gaming norm, what sense of place do we as gamers have anymore — if we ever had one in the first place? As someone who grew up reading and collecting comic books, I ask that you indulge me for a moment while a geek out a bit over the Avengers movie. Remarkably, I actually found the time and the motivation to plan to see a movie in the movie theater for the first time in years this weekend. I must say, I was really impressed and (save for the extra dough forked over to see it 3D, which rather than further immerse me into the movie always managed to take me out of the movie, calling attention to the special 3D effect rather than the story), I was entirely satisfied with the time and money I spent. Indeed, an argument can be made that Avengers is the best superhero movie ever made. Certainly, it is the best ensemble superhero movie by several orders of magnitude. As Kurt Loder accurately observes, the real hero in all of this is Joss Whedon whose masterful skill at ensemble story telling is on full display. Personally, though, Avengers is not my favorite of all time. In the end, I have always been more of a DC kinda guy and Christopher Nolan’s take on Batman takes the cake for me. Ironically, the reason for this comes down to a superhero I want to despise, but can never bring myself to actually spurn — Superman. Marvel superheroes are all about the struggle to protect humanity, DC superheroes are all about the struggle of becoming human. It is not that Marvel is bad — see my comments about Avengers above — it is that I find the archetypal struggle found in DC to be more compelling. Superman is one of the most powerful superheroes in all of the comic book world. He is an alien from another planet. He ought to be a character we cannot really relate to and the stories one can tell about him should be tiny in number. Yet, he is one of the most beloved and longstanding superheroes of all time. The reason being that the real hero isn’t the guy who wears the ’S’ on his chest — the real hero is Clark Kent. Superman is as endearing as he is because he struggles to be human. This struggle permeates the DC universe. Even Batman — who has no superpowers — struggles with his own humanity because he is so broken. These stories really speak to me as a Christian because this struggle — to become human — is at the core of my faith. Humanity is born broken. Ours is a struggle to repair that damage by following in the footsteps of Christ and uniting ourselves to Him. Don’t get me wrong, Marvel does deal with very real issues that affect us as human beings — the mutants being an analog for racism being a big one; however, even at their best (and the Avengers movie is one of the best things Marvel has ever produced), they don’t reach to the depth of the DC universe, especially when DC is done right. Today is the feast of St. Epiphanius, Bishop of Cyprus. Born in Palestine in A.D. 310, he was the son of poor farmers. In his youth he accepted the Christian faith and eventually became a monk in Egypt. His faith and virtue became known far and wide and the people wanted him elected as bishop. This portion of his life is akin to the story of Jonah. Rather than acquiesce to the people, he fled. Everywhere he went, the calls of the people to elect him bishop followed. Finally, his friend St. Hilarion advised him to go to Constantia (also known as Salamis) in Cyprus. Knowing that such a voyage would result in his ordination, Epiphanius boarded a ship to Gaza; however, contrary winds forced the boat to come to port in Constantia. At this point, the saint bent his will and became bishop. He became a fervent defender of orthodoxy against the Arians. He was held in such high honor that even Arian emperors dared not move against him. 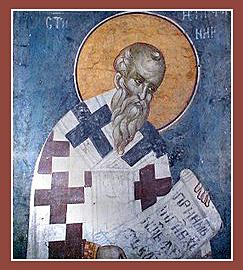 St. Epiphanius is probably most famous for his seminal work, the Panarion, which catalogues eighty different heresies. Though modern scholars question the accuracy of some of his entries, the Panarion is still an indispensable historical witness for the history of Christian dogma and the Church. I suppose I could spend some time talking about how the life of St. Epiphanies and Jonah appear to justify a rail-roady style of game play. Personally, I would argue the opposite. In both cases, Epiphanius and Jonah were free to disobey and run away from their calling — they just had to live with the consequences. This is fundamentally different than a rail road, which (at best) makes the players feel as if they have choice when no matter what they do, they will always end up in the same place. This does not interest me, however, as much as his efforts to catalogue all the various heresies of his day. At the risk of having commenters claim that alignment causes brain damage, I can’t help but see the parallel to alignment in D&D. From an Orthodox POV, the Panarion is a necessary exercise. Dogma answers that vital question, “Who is God?” Different answers have different consequences in behavior, ethics, institutional structure and a whole slew of other ways faith gets expressed. Thus, if one is interested in maintaining a particular faith experience, one must insist upon answering the question “Who is God?” in the same way from generation to generation. The Panarion mirrors alignment in D&D because it is an attempt to categorize different kinds of behavior and ethical systems for use in game play. This is particularly true of the nine-point alignment system of AD&D — a system that has always raised my hackles. Ironically, the Panarion is a good way for me to explain why. Although I have spilled a lot of digital ink over the past several years meditating upon alignment on this blog, in practice I have come to the conclusion that the three-point alignment system of OD&D and B/X is the most practical and the one that allows the most freedom for both referees and players. Though the AD&D alignment system appears to grant three times as much choice, it is actually extremely limiting. The Panarion demonstrates why. If one considers that Christianity in all its various forms (both orthodox and heterodox) to fall under Lawful or Good alignments, then St. Epiphanius demonstrates that it is necessary to create at least eighty different categories within this narrow spectrum of the alignment system, since each of the different heresies brings with it a different (if similar) ethical outlook. Whereas the three-point system is general enough to allow for this variation all under the umbrella of Lawful, the nine-point system of AD&D does not. Indeed, Lawful Good, Lawful Neutral and Lawful Evil are all so narrow as to completely ignore a vast amount of Lawful human behavior. Personally, this is one of the reasons why I think alignment has historically been one of the most controversial aspects of the game. One of the peripheral consequences of working on my re-imagined Slave Pits of the Undercity (which itself is a result of WotC re-releasing the three 1ed core books) is my own casual re-assessment of ADnD. I have found myself more frequently perusing my ADnD collection than I have in years. There is one exception to this, however. Though I am very familiar with some sections within it, the ADnD DMG still remains largely impenetrable for me. I am one of those life-long DnD players who was initiated into the game by those who already knew how to play, rather than someone who is self-taught. When it came time for me to try my hand at DMing (as I called it then), Holmes, Moldvay and Cook held larger sway on me than did Gygax because, despite my group playing “ADnD” these great editors were far more approachable in their advice. So, though I used ADnD rules and tables, my mentors were from the world of B/X and Holmes. This may come as a bit of a surprise, given that there are so many out there in the world of the OSR that cite the DMG as this great and seminal work of the hobby that is a seemingly ever-changing treasure trove of gaming history and advice. This love affair is to the point that there are some who would choose the DMG as the only RPG book that they could have if stranded on a deserted island. In a way, this reminds me of the Philokalia — a collection of Orthodox Christian spiritual writing compiled and published in the 18th century. In it one can find meditations from the 4th century through the 15th century by a total of thirty-six different authors. It has been described as a seminal collection of such import that it is second only to the Scriptures themselves in the spiritual life of the Orthodox Christian. The compilers organized the book chronologically. If one attempts to read it thusly (cover to cover), however, the book is rendered impenetrable. Rather, it requires an initiation on how to read it and what order to read the various authors. There are several historical methods, but all of them parallel each other. They all form a key with which to unlock this precious gift. As one who still finds the DMG to be something of a Philokalic mystery, and since so many of my generation had some kind of initiation process into the hobby, I am wondering if there isn’t some kind of pattern out there for tackling the DMG? Is there a particular order for taking advantage of all the goodness that lies therein? I do not ask this only for myself, but for those who will be buying their first 1ed DMG sometime this summer. Unlike later editions of the game, ADnD is a bit of an editorial mess. In order that those who encounter it for the first time have the best experience possible, it might behoove those of us who love the old ways to make the world of ADnD a tad more accessible. This session was one of those that got thrown together at the last moment. As a group, we want to get to play as often as we can with Dn. Goram’s player before he heads off to his graduate studies. Therefore, when there is window for him to play, we usually try to take advantage. As a result, Ahkmed’s player was unable to come at the beginning of the session because he had made previous plans to see The Avengers. Interestingly, when he finally showed up to ask what had happened, the answer given by some of the players was, “We haven’t accomplished much today.” Indeed, much of the session was spent wandering lost through wilderness and even this only resulted in two combat encounters — the only combat of the whole session. However, we all had a great deal of fun not accomplishing much. This was a session where the vast majority of the time was spent roleplaying where lots of discussion happened at the table in character. In a way, this was a very necessary step as the campaign has opened an entirely new chapter. Up until this session, the campaign largely revolved around the desires and goals of Hamlen and his brother Dn. Goram. While Ahkmed has been a huge catalyst for many things evolving in the campaign, he has done so happily tagging along with the two brothers. Now that Hamlen is dead and buried and Dn. Goram is retired, the group needed time to figure out who they were, where they were going and why. With Gillek reincarnated as a troll, the party was not particularly keen on having him as the de-facto leader of the party. It was thus decided that Dn. Swibish, being the highest level cleric in the party, should take the reigns. This was also, in part, an experiment by the players because Dn. Swibish’s player is now the most experienced of our youngest players. It was thus decided that they would head north and investigate all the hubbub surrounding Redwraith. As I stated earlier, this did not go as planned. There was an encounter with an ogre mage (which the party mistook as some kind of orc) and was hilarious due to the extensive use of charm spells. There was also an encounter with large spiders (which talk and love elf-meat). This also was entertaining due to the fact that despite happening a couple years ago at the beginning of the campaign, the first encounter with these type of spiders was memorable enough to get a great reaction from my players. Die and get raised by the now NPC Dn. Goram. Get turned to stone prior to dying and hope that the party finds a Stone to Flesh spell at some point in the future. Surprisingly, he chose the latter. Needing a new character, he rolled up a rather pathetic set of scores, and decided to give a shot at playing a half-orc fighter named Gog. He entered the picture as a slave of the Dwarves at the dwarven citadel north of Headwaters (which the party eventually did finally find). A lot of fun was had as this new character was introduced into the party. Redwraith was not always ruled by necromancers. In the days when the area was a colony for the Empire, Redwraith was established with its own bishop. The necromancers came to power when the magic-users of the city decided to fight fire with fire when the Black Tower arose and attacked the city with an army of undead. The Redwraith necromancers have been obsessed with making sure the Black Tower stays destroyed ever since. Since Dn. Swibish is under a sentence of death for conspiring with the necromancer Xerxes (someone the party is convinced they killed, but have no evidence — he was eaten by the dragon in a bag of holding), the bishop of Redwraith has been marginalized by the leaders of the city. Things are so tense now, that if he makes a misstep, he may himself be accused of being a Black Tower spy and executed. The Black Tower is surrounded by six obelisks etched in glowing runes that the party recognize from items used by the Sons of Cyn. They emit a magical shield which is, in essence, a giant Protection from Undead spell, making it impossible for the Redwraith army to attack the Black Tower. There is an army gathering around the Black Tower, all within the confines of the Protection spell. It is largely made up of local goblin tribes led by ogres and a black-skinned type of goblin the party encountered beneath the castle in Trisagia many moons ago. At the center of the protective ring some kind of structure is being built. It was of similar appearance to the machines the party saw in the brain lasher city. The party also caught a brief glimpse of someone wearing a golden mask working on the machinery. This coincided with a very brief opening of a portal where the machinery was being built. Ahkmed has been slowly working on translating a manual on the mining and use of Azoth (aka liquid magic). His endeavors have resulted in the discovery that the mining of Azoth has a tendency to create tears in the fabric of time and space. Therefore, machinery is required to contain these tears so that they don’t become catastrophic. It was here that the party realized that the Brain Lasher city was an Azoth mining colony and that they had, in fact, destroyed the machinery that kept their tear in check. They began to wonder what kind of consequences this was going to have. The session ended with the party convincing the necromancers to give them some scrolls to aid in scouting out the Black Tower camp in detail. 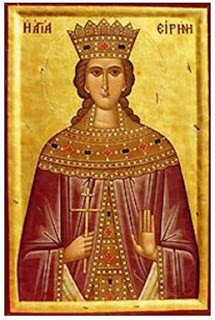 Today is the feast of St. Irene. She was born Penelope to a noble in the Persian city of Magedon. Through her tutor Appellian, she was able to discern a divine vision which convinced her to become a Christian. As a Christian, she took on the name Irene (which means peace). There are several miracle stories about her life as she travelled from place to place bringing thousands to Christ. My favorite is her first. When her father found out that had become a Christian and refused to worship pagan gods, he had her tortured. Realizing that she would not turn from Christ, he had her bound and thrown beneath the hooves of horses to be trampled to death. Not only was she unharmed, but one of the horses reared up and killed her father. Through her faith and prayer, however, he was brought back to life and came to believe in Christ. She died in Ephesus in the first half of the 4th century. Today, she is considered the patron of the Aegean island of Thera, which is more commonly known as Santorini, which is a corruption of the name Saint Irene. One of the things that I probably struggle with the most when making any campaign world are place names. I have found that good names can add a level of depth to a world and poor names can break the suspension of disbelief necessary for any sense of immersion. Personally, I have a few tricks that I do use. Having a couple of polyglots in the family means I have access to a variety of different languages. I like to assign a specific language to a specific race. While this works very well, it is hard work and since my players often don’t know Greek, Romanian, Latin, German, Hungarian, etc. (all languages I have used in the past), the world doesn’t come alive for them in the same way it did for me when I first named all those places. One of my favorite examples is the modern name for Constantinople — Istanbul. In its heyday, the capital city of the Christian Roman Empire was simply referred to as The City. Thus, when people who were traveling to the capital were asked where they were going, they would simply answer, “To the City.” In Greek, this sounds like eis tin poli. To the non-Greek speaker, this sounds like Istanbul by which it is known to this day. The beauty of all of these names is that there is a story behind each of them — an implied history. Even if I have no idea who the general is after whom the town Fort Hamlen is named or the saint after whom Sangorum is named when I put the place on a map, there is an open invitation to create that history if a player ever asks. Indeed, such a story can lead to an adventure or three. The real beauty of using such a naming convention, however, is when a place comes to be known for the exploits of a PC. Then, not only do you know the history of the place, you got to see it unfold at the gaming table. In order to warm myself up to the idea of writing (brief and not-so-brief) descriptions of various rooms in the dungeon areas of my re-imagined Slave Pits of the Undercity, I have been playing around with a rumor table. There is always going to be the challenge of trying to determine what amount of information players should have about a particular location — especially of the kind that will encourage more investigation. The rumor table I am trying to make has the added challenge of including red herrings about a pair of other villages which the PCs or their patrons might suspect are the base of operations for the slave trade that the adventure is all about eradicating. Given these challenges, I decided to go back and revisit some rumor tables from classic modules for inspiration. Zelligar had a wizard's workshop in the stronghold where he worked on magic stronger than any known to man. Rogahn owned a fantastic gem as big as a man's fist that was worth over 100,000 gold pieces; he kept it hidden in his personal quarters. The place is protected by the gods themselves, and one member of any party of intruders is doomed to certain death. The treasures of Zelligar and Rogahn are safely hidden in a pool of water. The entire place is filled with guards left behind by Zelligar and Rogahn. An enchanted stone within the stronghold will grant a wish to anyone who chips off a piece of it and places it within their mouth. All treasures of Zelligar and Rogahn are cursed to bring ill to any who possess them. Zelligar and Rogahn have actually returned to their stronghold, and woe be to any unwelcome visitors! From a gaming perspective, none of these are particularly useful. Some are so outrageous that they can be dismissed out of hand, and therefore have no impact on the game. The two I like the least — the 100,000 gp gem and the enchanted wishing stone — are set-ups for player disappointment (tempered slightly by how exaggerated the claims may be). The only rumor that is useful at all is the one about treasure in the pool of water. Given that there is a room of magical pools, this might encourage otherwise cautious players to fiddle with dangerous magic; however, given the potential lethality of such a course of action, I suspect this would lead to frustration on the part of a player. This made me realize that one thing that I want out of a rumor table is truth. James of Grognardia fame once quoted a piece of wisdom from K&K Alehouse about how every lock should have a key. I would extend that philosophy to rumors — every rumor should have at least a grain of truth. I say this, because that truth, however small, has the potential for shaping the campaign and therefore create a living, breathing campaign world. The Baronette is an illusionist who wants the throne of Restenford. The captain of the guard of the garrison in Restenford has a magic horn that can cause walls to collapse. The Baron has it all hidden under his castle. There is an unguarded fortune down there somewhere. That magic-user who calls himself a sorcerer is only an enchanter. The Baron of Restenford is really chaotic evil. Falco's tavern is run by two assassins. One or more of the clerics at the abbey is really an evil devil worshipper. Note that there are italicized parts of each sentence — these are the false bits of information. Therefore, every one of these statements has a bit of truth, so that when the players come into contact with the whole truth they will be surprised, but not disappointed. Indeed, I foresee the classic trope of one player looking at another and saying, “I thought you said this was unguarded!?" Besides, imagine how much cooler Quasqueton could be if some of those false rumors were partially true (especially that last one)? Notes: Much of the eastern wall, the temple itself and the monastic cells were destroyed when the followers of St. Cuthbert were slaughtered; however, the building with guest rooms was spared much of the destruction. The tower is new construction. The half-breeds/sea blood who guard the Temple do so specifically to obfuscate the entrance to the Slave Pits. Like the villagers of Hinsmount, they will be unwelcoming of strangers and insist that the Temple is under repair and not safe for visitors. The Temple — this has been largely ignored by the Kuo-Toa/Deep Ones. The location marked 'a' is what remains of the altar. If searched 2d6 Beads of St. Cuthbert can be found. Guest Room — these are now primarily used the the Half-breeds/Sea Bloods in charge of guarding the temple. There will be 1d3-1 present at all times. Apse with Mosaic — these miraculously survived both the pirates/humanoids and the Kuo-Toas/Deep Ones. They depict the arrival of St. Cuthbert, his life and the miracles performed through him. For those who wish to have St. Cuthbert a visitor to your campaign world from our own earth, this would be one way to give the PCs a clue about his origin. Chapel — this has been thoroughly defiled and is now used as an entrance into the Slave Pits. Guest Greeting Room — this used to be where guests were welcomed and shown to their rooms. It is now used as a guard room with 1d6 half-breeds/sea bloods at all times. Monastic Cells — although these cells have been spared destruction, the Kuo-Toa/Deep Ones have largely ignored them, though the ones closer to the kitchen (Rm. 9) will occasionally be used for storage. One is also used as a kennel for three sting hounds who are used when intruders become too nosey. Monastic Cells — these have have been destroyed and are in various states of disrepair. At best, the walls are still standing, but the ceiling has collapsed. At worst they are nothing but rubble. Monastic Cell — a giant spider has made its lair here. Kitchen — this is still used by the guards as a place to prepare meals. These primarily consists of fish brought to the temple from the village. Refectory — this is still used as the primary place for the guards to eat. At one time, the walls were decorated in mosaic icons. These have mostly been destroyed. Guard Tower — this poorly constructed two-story look-out tower is made from rubble. It is used by the guards to scan the immediate area for intruders. There will always be 1d6 half-breeds/sea bloods here. Guardhouse/Registry — at one time, this was where guests would register to stay at the monastery and temple. For those interested, these records (while in poor shape) have survived. There is also a current, fake registry book (of different manufacture) where there are a combination of fake and real entries (the real ones being stubborn visitors to the island who may or may not now be slaves). There will always be 1d6 half-breeds/sea bloods here. Courtyard — once a place of peace and contemplation, the tree in the middle of the yard has suffered so much spiritual and physical pain from both the pirates/humanoids and Kuo-Toa/Deep Ones it is now undead. Reliquary — this is where the relics of St. Cuthbert are kept. Unknown to the Kuo-Toa/Deep Ones, there is a secret trap door in the floor beneath the rubble. This leads to a crypt wherein are the relics of the saint. He is holding his Gospel. Should PCs manage to find this place, it will provide a safe haven for them to rest and recover (no wandering monster checks).